Starting in 2015, the state of New York embarked on an unprecedented experiment in raising its minimum wage. Subsequent anecdotal and empirical evidence suggests these increases were tremendously-disruptive to New York’s service industry. Nevertheless, in December 2017 Governor Cuomo indicated his interest in further raising the base wage for tipped employees— eliminating the state’s tip credit and making New York one of just a handful of states that doesn’t treat tips as income in its labor law. 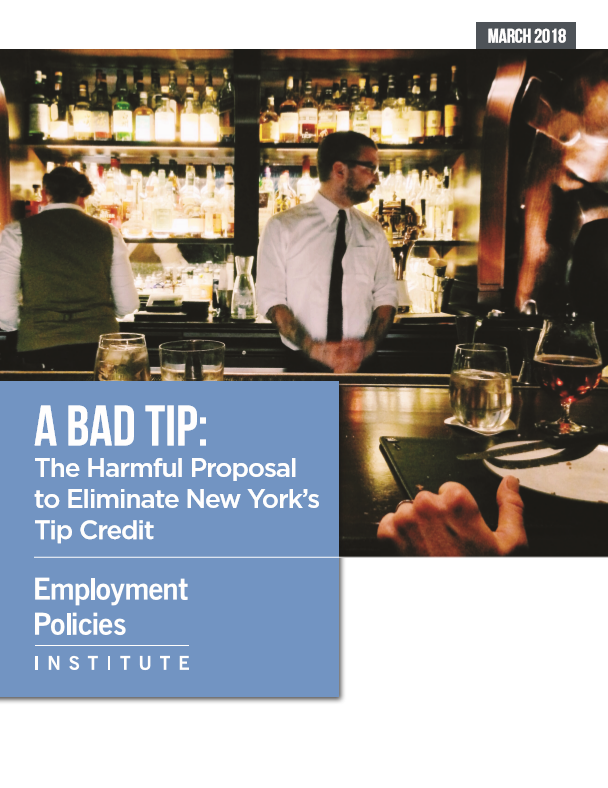 A new analysis of data from the Labor Department and the Census Bureau, as well as careful scrutiny of ROC’s report, demonstrates that neither of these claims—which form the foundation for the Governor’s push to eliminate the tip credit—are true. After the state’s 50-percent tipped wage hike in late 2015, Labor Department data show that employment growth in the state’s full-service restaurants fell to less than one-third of its average over the previous three years. New York State also lost over 270 full-service restaurants—after consistent growth in prior years. In New York City, the damage was even worse; a rising tipped wage reduced robust full-service employment growth averaging 6.7 percent down to barely one percent. ROC is also careless with the use of its own statistics. In a recent report titled “Better Wages, Better Tips,” ROC cites its 2014 report to back up the claim that female tipped workers report half the rate of sexual harassment in states without a tip credit. Yet a careful reading of ROC’s own report shows that this isn’t true. According to Census Bureau data, tipped restaurant servers self-report earning nearly $20 per hour on average in New York City, and over $17 an hour on average statewide. These estimates are likely conservative; a survey of thousands of servers from the New York City Hospitality Alliance suggests the average take-home pay is closer to $25 an hour. Because of their substantial tip income, Census Bureau data show that servers and bartenders in New York have a poverty rate that’s roughly two-percentage points lower than the poverty rate for other non-managerial restaurant occupations. The facts are clear: The Governor’s prior tipped wage hikes have harmed full-service restaurants, and the case for future increases is based solely on a flawed study that doesn’t survive basic scrutiny.